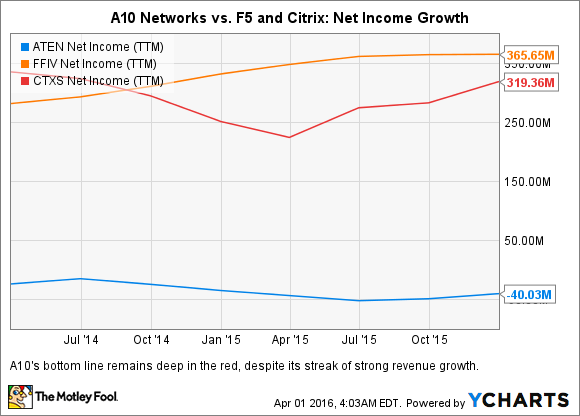 Will A10 Networks, Inc. Sink or Swim in 2016? Why did this small-cap tech stock rally nearly 40% over the past year? Shares of A10 Networks (NYSE:ATEN) have rallied nearly 40% over the past 12 months, thanks to its healthy streak of beating top- and bottom-line estimates for four consecutive quarters. During the networking technologies provider's most recent quarter, sales rose 25% annually to $56.6 million, beating estimates by $2.1 million. Furthermore, A10 expects sales for the current quarter to rise 22% at the midpoint of its guidance, while analysts expect its revenue to rise 16% for the full year. A10 still isn't profitable, but it has been narrowing its net losses on a non-GAAP basis. Let's take a closer look at A10 and whether its stock will sink or swim in 2016. A10 Networks' ADC. Source: A10 Networks. A10 sells three software-based advanced application networking solutions, all of which are built on its Advanced Core Operating System (ACOS). These three solutions include Application Delivery Controllers (ADCs), which optimize data center performance; Carrier Grade Networking (CGN) products, which provide address and protocol translation services; and Distributed Denial of Service Threat Protection Systems (TPS) for network security. That growth is fueled by A10's ability to keep adding customers. The company added 200 customers last quarter, boosting its total end-customer base to 4,700. A10 attributes that "record" growth to a "broad-based increase in demand across our product portfolio and customer verticals." Those victories all boosted A10's enterprise bookings 23% annually during the quarter. Product revenues rose 22% and accounted for 70% of A10's top line, while service revenues rose 33% and accounted for the rest. Looking ahead, the company believes that the enterprise transition to the cloud will boost demand for its three core solutions. Last November, Oppenheimer analysts also expressed confidence that A10's Thunder TPS security solution, which generated 10% of its sales last quarter, will become a new pillar of growth. 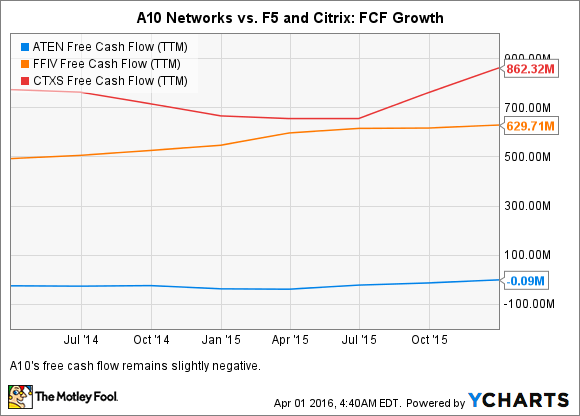 Moreover, A10 still has a negative free cash flow. The company's total cash and equivalents rose 7% annually to $98.1 million last quarter, and it hopes to become profitable later this year, but it remains vulnerable to any aggressive pricing and bundling strategies from F5, Citrix, or other more diversified competitors. A10's sales and marketing already rose 10% annually and gobbled up nearly three-fourths of its revenue last quarter, so it could struggle to respond to those threats. Lastly, A10's lack of profitability makes it hard to compare its stock price to its earnings growth potential. The company's P/S ratio of 1.8 compares favorably to F5 and Citrix, which both trade at 3.7 times trailing sales. However, A10's lack of earnings growth could cause the stock to be sold off faster than either rival in a volatile market. A10 might struggle against bigger rivals like F5 and Citrix, but the company's strong sales growth, its partnership with Cisco, and its confidence in turning a profit this year indicate that overall sentiment should be more bullish than bearish. This small-cap stock certainly isn't suited for risk-averse investors, but patient investors who can stomach its volatility might be rewarded in the long term.